Drain care in the Reading area isn’t just about lifting manholes and high pressure water jetting to clear a blocked drain. Problems with drainage can start much closer to the source of the problem and build up of uric scale in urinal pipes is a good example of this. Many of our customers manage large offices and public buildings with Reading’s economy being one of the most vibrant in the UK . Maintaining fully operational urinals is essential for reasons of hygiene and for staff and customer satisfaction. 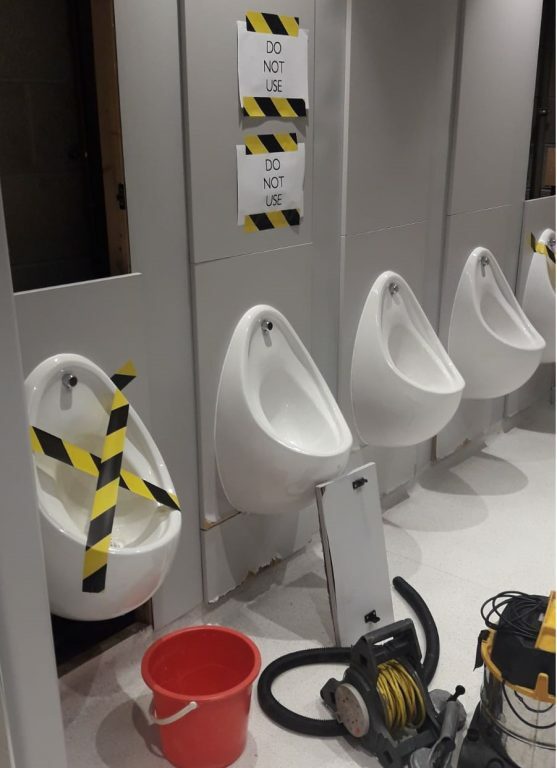 One of our most common emergency call-outs is when a blocked urinal occurs and more often than not this is because regular drain maintenance has been neglected. In certain scenarios, such as in a pub or restaurant, this can present a particularly poor impression and even be business critical. So why does this happen ? If this happens to you then be sure to call Metro Reading and our skilled engineers will attend promptly. 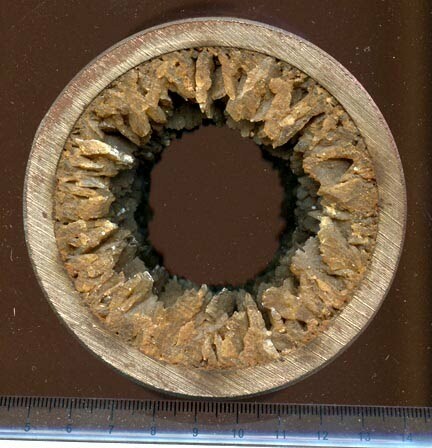 Using electro-mechanical cleaning methods we have the ability to remove scale from pipework. As the picture below demonstrates this can be severe and reduce the diameter and even completely block your urinal pipes. Of course when it comes to drain care prevention is better than cure and a Metro Rod pre-planned maintenance programme is the perfect way to ensure you never suffer from a blocked urinal. Contact us today for a free site assessment and we will be happy to look at formulating a maintenance schedule suited to your needs and budget. Metro Rod Reading covers a wide area and we are unblocking drains and unblocking toilets every day in Reading and all surrounding areas such as Wokingham, Bracknell, Woodley, Caversham, Newbury and across Berkshire as a whole. Our commercial pre-planned maintenance programmes cover some of the largest “blue-chip” offices in the area and we are proud to support the businesses and economy of Reading. Similarly if you are a local resident suddenly finding you have a blocked toilet, blocked sink or blocked drain at home then call us and we will be out to take away your problem in no time. At the more technical ens of the scale we will carry out CCTV drain surveys and repair damaged and cracked pipes , whether by traditional excavation or, wherever possible, by no-dig drain repair methods. Many construction companies in the Reading area have benefited from our services. If you would like to find out more, give us a ring on 0808 208 2654 . Alternatively you can call our emergency helpline on 0800 66 88 00 24 hours a day.